Last week as part of the UFO challenge for Iron Craft, I finished one of these potted button trees that I had been sitting for almost a year. I promised I would share the pattern with all of you this week and here it is. These were so quick to make up that I made two more in a medium and small size on top of the one I had made last week. Color-wise, I stuck to the colors of my inspiration trees from a Christmas store in Bruges, Belgium, but I think they could be done in so many ways. The ones I made are red on one side and white on the other, which goes well with the Scandinavian way I tend to decorate for the holidays. But I could also see them done in more natural colors with green trees and the original terra cotta colored pot. Or you could take them a glam route and knit black and white trees with sparkly buttons and paint your pots silver. The variations could fit any style. Paint the dowels white and the pots red. You don’t need to worry about painting the whole dowel, just what will show. Let dry while you make the trees. Needles – Size 7 or size to get gauge. 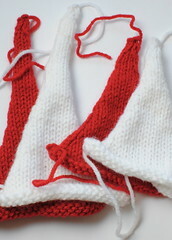 Knit two triangles of the same size for each tree. My trees are red on one side and white on the other. Row 2 – k1, ssk, k until last 3 stitches, k2tog, k1. 28 stitches remain. Working in stockinette, decrease in this manner every 4th row 7 more times. 14 stitches remain. Then decrease in this manner every 6th row 5 times. 4 stitches remain. Work 3 more row in stockinette. Row 2 – k1, ssk, k until last 3 stitches, k2tog, k1. 26 stitches remain. Then decrease in this manner every 6th row 4 times. 4 stitches remain. Working in stockinette, decrease in this manner every 2nd row 4 more times. 16 stitches remain. Then decrease in this manner every 4th row 6 times. 4 stitches remain. 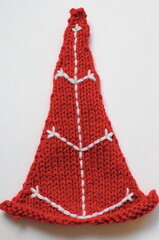 Using red thread on the white triangle and white on the red triangle, backstitch on the branches and trunk. 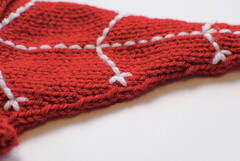 The vertical stitches are two knit stitches tall, the diagonal stitches are one knit stitch wide. I like to do the two bottom branches first, then the center trunk and top two branches. From there you can evenly space out the branches in-between. 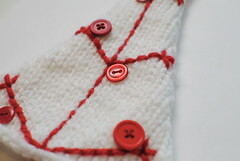 Make sure the branches end before the last two stitches on the sides of the triangle. Using co-ordinating thread sew buttons on the trees. 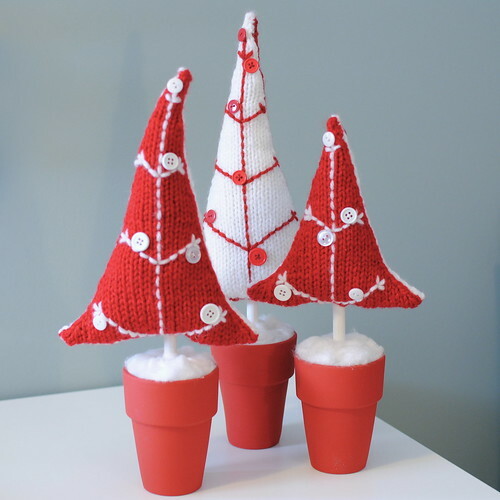 Sew the trees together using either color yarn. 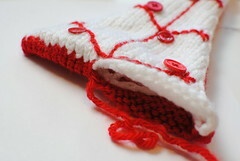 Start by using mattress stitch up on side and down the other. Then horizontally seam just about halfway across the middle. Start lightly stuffing the tree, you don’t want to over stuff these. You want them to stand up, but not be round. Stuff the top fully about 1 1/2″ down and the side where the bottom is closed. Gently put your dowel in (with your top stuffed the dowel should only go in about 1 1/2″ from the top of the tree) and stuff the open side. 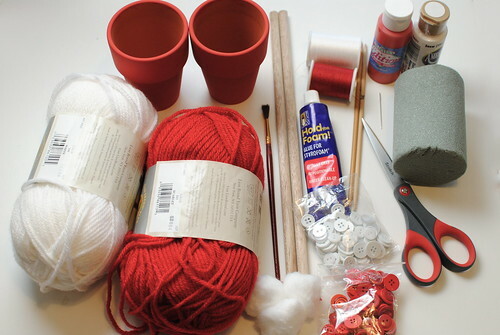 Pull the yarn around the dowel on the side of the tree that is the same color as the yarn you are using to sew. Finish horizontally seaming the bottom. Weave in the end. 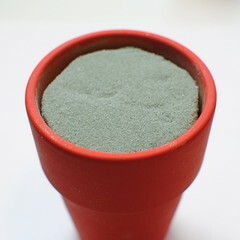 Using your serrated knife trim the florist foam to fit in the pot. It doesn’t have to fill the whole thing. Make sure the foam sits about 1/4 inch below the top of the pot. You can glue it in with the foam glue, but it should be snug enough that you don’t need to. Stick the dowel in the center of the foam as straight as you possibly can. This will take a little bit of force. Once again you can use a little foam glue if you want. Put some foam glue on top of the foam in the pot and cover with shredded cotton ball to look like snow. If you knit up a set of these we’d love to see them! Add your picture to our Flickr group. 8 years ago by Kat in Christmas , Crafts , Holiday , Knitting , Knitting Projects , Needlecraft , Projects | You can follow any responses to this entry through the RSS feed. You can leave a response, or trackback from your own site. 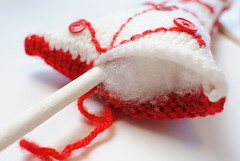 I’m one of the editors for the knitting site AllFreeKnitting.com. I absolutely LOVE this project and was hoping that you’d give me permission to link to it. I would also love to feature it in one of our newsletters along with a small picture. All credit, and the link, would go directly to this site. Would this be okay with you? I know our readers would absolutely love this adorable project. 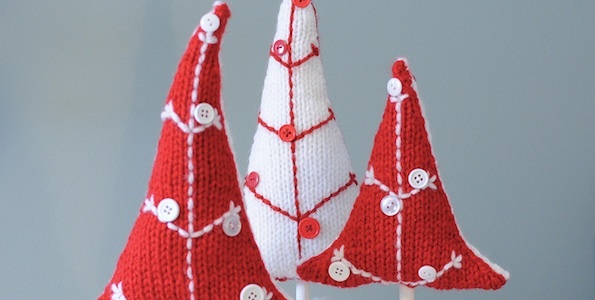 On the directions for the medium and small trees, after doing the initial Row 2, the directions say “Working in stockinette, decrease in thie manner every ‘2th’ row … ” What is the correct number here? Is it “4” or “2”? Eldeejay – Sorry it took a bit to get back to you, I’ve been on vacation for 2 weeks. In the patterns for the small and medium trees first you decrease every 2nd row a number of times and then you decrease every 4th row a number of times. The amount of rows between decreases changes throughout the pattern. Let me know if you need any more clarification. Thanks, Kat. I am really enjoying making these trees. Hope you enjoyed your vacation. I’m going to Pigeon Forge, TN next week for a brief getaway. I plan to spend every morning watching the sunrise over the Smokey Mountains, drinking coffee and KNITTING! Will post picture when I finish my first gift set.